You are visitor # 2 0 7 2 1 4. On Sunday the 14th of April, Joint Lunch of CIC Rethymnon will start at 1:00 pm. The venue is this time the Taverna ▶ Arhaia Lappa by the country road from Episkopi to Argyroupolis. It is located just after the double bend on the right hand side, 400 meters before the village entry of Argyroupolis. There will be Mixed Salad, Fasolia (beans), Kontosouvli (spit roast) and Fava (mash beans) as starters. For the main course there is a choice of Psito (roast lamb) or BBQ Chicken or Kokkinisto Xirino (pork in tomato sauce) with vegetable and Graviera cheese. The price of just 12.50 Euros per person also includes a dessert and Raki. Simply pay for any extra drinks. Guests and anyone interested are always welcome. Please send your application including your order for the main course until Thursday the 11th of April to: Ralph Krüger, email president@thecic.eu. Phone numbers for questions / special requests (e.g. vegetarian dishes): 6932 116341 or 28310 75362. 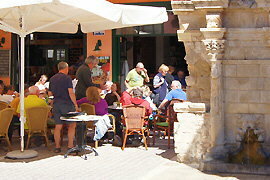 Before the meal, you can also participate in a stroll of the village of Argyroupolis. We meet at 11:30 am at the village square by the church. Please sign up and communicate your mobile phone number! On Sunday the 21st of April we will have our next bus excursion. It starts at 9:30 am at the office of the Rethymniotika Nea (post office exit of the weekly market) in Rethymnon. At 9:40 am, the bus will stop opposite the Taverna 1&1 in Misiria, and at 9:45 am at the SkyPark in Platanias. During our first stop at Vafes we will visit a traditional oil mill and a small folklore museum (admission free). Afterwards coffee break. At Dourakis' winery near Vrysses, a guided tour and a wine tasting await us. The entrance fee of 7.00 Euros per person includes the wine. 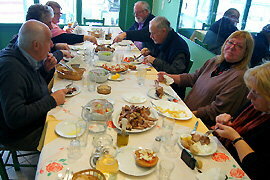 For lunch we will be in a taverna in Askifou. Guests and anyone interested are welcome. The participation fee is maximum 20.00 Euros, depending on the number of participants. 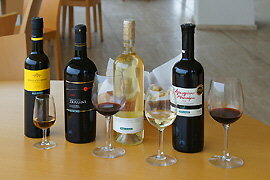 The wine tasting, the lunch and the coffee breaks are not included in the excursion price. Please send your application including your mobile phone number and your personal pick-up point (bus stop) until Thursday the 18th of April to: Ralph Krüger (CIC president), email president@thecic.eu. For questions: phone 28310 75362, mobile 69321 16341. During the summer half year it is being held at the taverna of Camping Elizabeth in Misiria. Turn off from the Old National Road cattycorner the big new ▶ church, follow the dirt road, and by the next corner turn right.